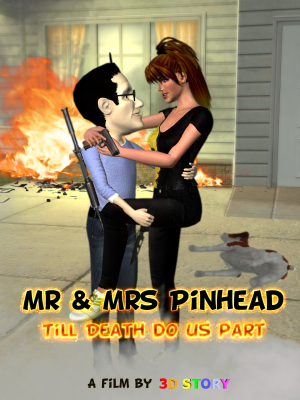 Here is my entry, which is the climactic battle scene from my latest Pinhead movie, Mr. & Mrs. Pinhead. Excellent scene! Perfectly executed. Love it! Very elaborately made​​. Especially, certain effects were used. Great scene. Loved the attention to details and the camerawork. Good luck! Pretty amazing true to life animation detail, Daniel. That helicopter is exactly how helicopters land. Most if us would have just plonked it straight down on the ground (well - Me, anyway). How you guys with unrelated daytime jobs manage to produce such outstanding Professional stuff, beats me. Hey Daniel, curious minds want to know: how did you achieve the bullet/shell casings being ejected from the (sub)machine guns? Mine was done with a custom particle emitter. @Peter - Thanks! There is only one way to produce so much work in parallel to a full time job … Pinhead obsession! @Phil - The ejected bullet casings, muzzle flashes and the odd blood splatters were all composed in Adobe After Effects. I composed a pre-keyed video of a spinning bullet casing over the iClone footage. Then to animate the casing, I just set up two or three position keyframes, the eject location, the top of the bullet casing arc and where it might land (usually offscreen). The top arc keyframe is set to easy-easy or whatever AE keyframe type makes it look slower at the top. All the SFX footage I purchased from Video Co-Pilot (Action Essentials Pack). Look forward to seeing your battle video! Ahhh...girls with grenade launchers and GE Mini-Guns....what's not to love!!! !